Transportation agencies with governments are always looking for new and creative ways to get the word out and raise awareness of poor driver habits. The newest and perhaps most creative we have seen in a while relates to the small town of Speed, Australia. 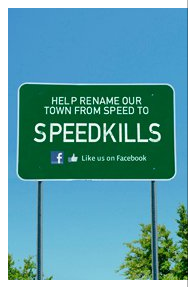 The town has agreed to change its name from Speed to Speedkills for the month of March. The plan was initially proposed by Australia’s Victoria state’s Transport Accident Commission (TAC). The name-change brings to life the Rename Speed road safety campaign which has gained more than 32,000 supporters online as well as extensive media coverage from local, national and international sources. The campaign, which aims to reduce rural road trauma and increase awareness of the dangers associated with speeding, was launched on 14 January. As of the day of this post there were 34,369 people who “Liked” this page. This story has gone viral throughout the internet helping to raise awareness for the dangers of speeding and driving. The TAC originally agreed to donate $10,000 to the towns Lions Club, but felt compelled to donate $20,000 because of the positive response. In light of the recent Facebook update lawsuit in Chicago, it is good to see social media helping to raise awareness of dangerous driving habits. Check out the Speed Kills Facebook page, but be certain to read up and do your part to raise awareness of these other campaigns in Georgia. This entry was posted in Blog and tagged atlanta injury attorney, facebook campaign, georgia governors office of highway safety, speeding accident, speedkills campaign. Bookmark the permalink.